It’s a challenge for Singapore’s great five-star restaurants to top the delicacies made available by the city’s street vendors. Singapore is known throughout Asia for the singular variety of its food. More than a hundred years before anyone ever used the word fusion to describe food, the Lion City’s busy docks were bringing in culinary influences from throughout Southeast Asia, India, Europe and the Middle East. Nowhere is the diversity of Singapore’s food more prominent than in the more than 100 hawker centers scattered throughout the city. These huge inexpensive street side food courts are the best in Asia for visitors because you can feel confident eating food from street vendors because of Singapore’s strict and stringent sanitary regulations. Chinatown’s Maxwell Road Hawker Centre has more than 100 stalls and is known for Tian Tian Chicken Rice, Zhen Zhen Porridge and the popular Char Kway Teow from the Marina South Delicious Food stall. British celebrity chef Gordon Ramsay held a press conference at the Tian Tian Chicken Rice stall for the Singtel Hawkers Heroes Challenge. Ramsay won the Chilli Crab Challenge but lost on the Laksa and Chicken Rice Challenges. The Tiong Bahru Market was built in the 1930s to the west of Chinatown and has since become Singapore’s hipster neighborhood. The Tiong Bahru wet market is similar to a European covered market; a place where shoppers can buy fresh produce, fish and meat, as well as cheese, which is particular to the Tiong Bahru Market. Upstairs is a hawker center with more than 80 stalls and seating for about 1,000 where Singapore’s classic Chicken Rice is available in the afternoon and evening. At breakfast specialties include cups of Kopi (strong coffee sweetened with condensed milk) and Zhui Kueh, rice pudding with pickles. The Old Airport Road Food Centre, located in Katong, is often recommended by Singapore taxi drivers to visitors. With nearly 170 stalls, the options feature traditional dishes like Lor Mee (thick, flat noodles in a spicy sauce) and Rojak (a savory fruit salad in a dressing of prawn paste, tamarind sauce and chili powder and garnished with crushed peanuts). The Changi Village Hawker Center, located close to Changi Point Ferry Terminal, reopened this summer after a multi-million dollar renovation. Changi Village is hailed as a Nasi Lemak haven by most locals. The International Nasi Lemak stall is known for Fried Chicken, Lemongrass-tinged Pandan Rice and chunky Otah. Anthony Bourdain felt it was well worth the trip during a recent visit. 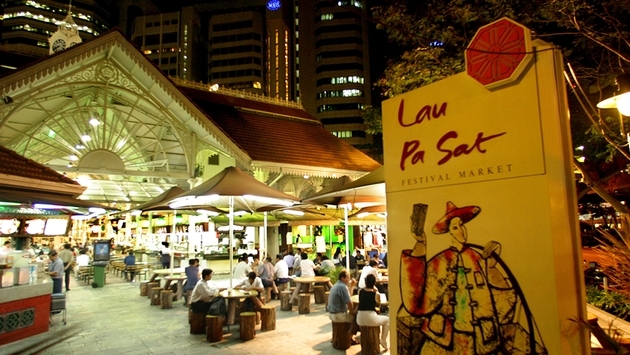 The Lau Pa Sat, located in the Central Business District, closed for renovations in September, but will reopen in early 2014. Lau Pa Sat is often said to be touristy by locals, but it doesn’t stop them from flocking from their nearby office at lunchtime for a Tiger beer and some Satay and Barbecue Shrimp after work.